Most of us won’t ever attempt to fix a broken phone, one that we might have cracked after dropping or that has died from water damage after being dunked in a pool. Fixing these things isn’t easy, requires special sets of tools and adhesives, and can be nearly impossible to do without causing further damage depending on the device. The Essential Phone is one of those that falls in that final category. This is a phone you likely won’t be able to repair. The crew at iFixit tore the Essential Phone down and struggled to do so without damaging components. Not only did the phone resist their adhesive-melting heat, they then had to apply Super Cold to “reverse the polarity” of the phone in order to get past the top display. Of course, once past that (and after cracking the hell out of it), they were able to dive into this tightly organized package and find some of the unique parts Essential included. They found the magnets for the modular add-ons, like Essential’s 360 camera, and a custom made front-facing camera piece that also housed the earpiece. Kind of cool stuff. 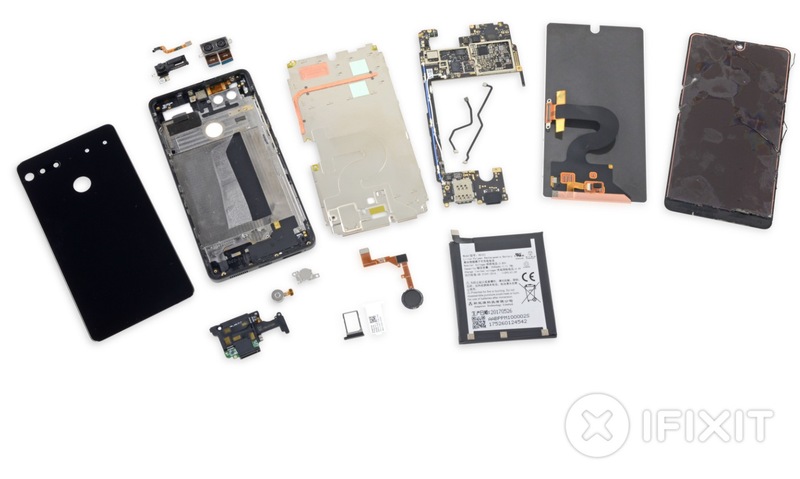 In the end, iFixit handed the Essential Phone a 1 out of 10 for repairability with 10 being the easiest to repair. In other words, should you need to swap something on the inside, it’s going to be tough to do. Does that matter that much in the grand scheme of things? Not really. After all, this phone has a titanium frame that should help it withstand drops. Then again, you may want to pick up that $99 extended care if you are worried about it. If you haven’t already, be sure to read our initial thoughts on the Essential Phone. Or Maybe the Pixel 2 Won't Run a Snapdragon 836?